The McCullock MC-1275 Heavy-Duty Steam Cleaner provides up to 1500 watts of steaming power. It makes no use of chemicals and it has a convenient steam-control switch. With a generous 50-ounce water-tank capacity, you can enjoy removing grease, stains, and grime for one full hour. 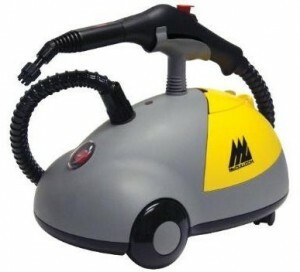 Aside from cleaning your upholstery and carpeting at home, this steam cleaner is also great at cleaning engines, wheels, and chrome accessories in cars, motorcycles, trucks, and even boats. Plus, this unit is easy to move around, thanks to its caster wheels and 12-foot power cord. The unit itself also has a storage compartment for its 10 included accessories. Attachments include a utility brush, steam jet nozzle, squeegee, 2 extension wands, terry cover for the floor brush, triangle brush, upholstery/floor brush, funnel, and measuring cup. This product has garnered 513 customer reviews on Amazon.com. Majority of the reviews are positive, with customers praising the McCulloch MC-1275 for its easy maintenance and sturdy construction. Cleaning power did not meet expectations – Some consumers were quite disappointed with the product. Although they admit that this unit does a decent job of cleaning, they expected more impressive results. A number of reviewers felt that the pressure and temperature it produced were not enough to get rid of tougher stains and dirt. Brushes don’t last long – Some customers also complained that the brushes included with this steam cleaner wear out easily. Cleaning with this machine takes quite a while – Reviewers also commented that the unit tends to sputter every few minutes and you have to wait before it heats up again. Cleans well – Contrary to what other reviewers stated, there were plenty of Amazon customers who claim that this steam cleaner does a good job of removing dirt and stains around the house. It admittedly has more difficulty getting rid of tougher stains, but if you know what to expect from this cleaner, you will enjoy using it in your daily chores. Great customer service – Users also commented that the customer service was efficient and replacements were delivered on time. Sturdy construction – Customers were pleased with the machine’s solid build. All the parts look durable and are made of high quality materials. Compact size – Its compact size makes this unit a cinch to store and carry. It doesn’t take up too much space and it’s not cumbersome to move around. Reviews for this product are quite mixed. There are those who think this product underperforms while others are quite satisfied with its performance. In the end, it all depends on the customer’s gut feeling if they are willing to take a gamble on this product or not.